Japan Airlines (JAL) has just announced it will be flying a Boeing 767-300ER painted with special Doraemon livery domestically in the coming months. 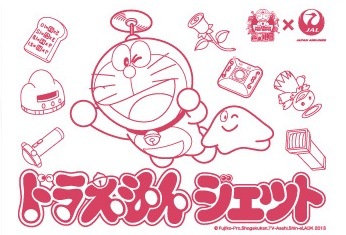 This is to promote the 2013 Doraemon movie: Nobita's Secret Gadget Museum scheduled to be released on March 9 2013. The 767-300ER painted with special livery will be JA656J, one of the new 767s delivered last year that went straight to JAL's domestic fleet. JAL has yet to unveil the special livery but there is a hint and description of what the livery will look like. Given the theme of the movie is the secret gadgets, JAL will paint the Doramon Movie 2013 logo together with Nobita, Doramon and Dorami (Doramon's sister) together with the gadgets on the fuselage. Although not very clear, you can get an idea of how the livery will look like from the inflatable plane and pouch below. The inflight service and cabin will also be slightly different for the JAL Doraemon Jet 2013. A special headrest cover with Doraemon and its gadgets will be used. Also, special Doraemon toys and postcards will be available. JAL will also play a special message from Doraemon highlight the upcoming movie as part of the inflight entertainment. Of course, JAL has something more than just a special livery planned for the Doraemon fans. Just like the last Doraemon Jet, JALPAK (JAL's travel agency) will organize daily special Doraemon tours to Sapporo departing from Tokyo, Nagoya, Osaka, Fukuoka, Sendai and Hiroshima between December 25 2012 and March 31 2013. Although there's no guarantee that you can fly on the Doraemon Jet with this tour, you will get a Doraemon room at the hotel, some JAL x Doraemon original merchandises like the ones shown above, ticket to the Doraemon Wakuwaku Sky Park at the New Chitose Airport and you can enjoy a soft drink at the Doraemon Cafe. And for those who booked the tours, you will also have a chance to win some special prizes. 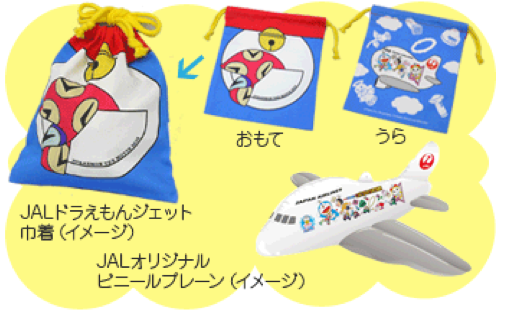 Blue Sky and JAL Shopping website will offer some JAL x Doraemon original goods such as model planes with special livery, keychains and towels. These will be available from late December. To find out more about JAL Doraemon Jet 2013, you can refer to the microsite created by JAL (Japanese only). Quite a lot of information are listed as coming soon so expect more updates and pictures in the coming days. FOR ALL DORAEMON LOVERS AND THOSE WHO WANT TO HAVE MORE GIFT IDEAS. VISIT http://doraemon-lovers1.blogspot.sg/ NOW!